The frustrated complain that the term is redundant in the same way that “tuna fish sandwich” and “hot water heater” are redundant. Grammarians engage in pen vs. ink pen debates, and even some colleges list ‘ink pen’ as something of a grammatical error. “ink pen” is the redundant phrase. I can’t think of any pen that does not contain ink. Can you? If you state something is a pen, the reader can safely assume it has ink without clarification. The idea that the term could be annoying had never occurred to me because, well, I’m one of those people who go around saying “ink pen” willy-nilly. It’s just one of those things I’ve always said, and always will say. I’ve even used it in blog headlines and posts, which has caused some stress for a few readers, it seems. It turns out that this is something of an Americanism. Specifically, it’s a Southern thing…by way of Ireland. Let me explain. Linguists call it the Pin-Pen Merger, a regional language effect in which the pronunciation of certain -en and -in words have gradually drifted closer and closer until they’ve become virtually indistinguishable. They believe the roots of this pin-pen linguistic trait can be traced back to parts of Ireland, where it was once common usage. As Irish immigrants began to settle the Southern US, the pin-pen merger became a prevalent part of the regional dialect. It has largely fallen out of use in Ireland and but remains a normal part of American Southern speech. 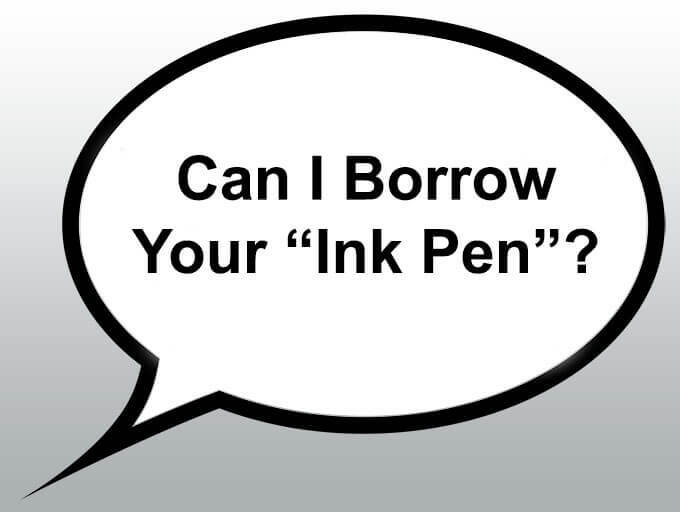 Given the merger, the theory is that American Southerners tend to use the term ‘ink pen’ to distinguish ‘pen’ from ‘pin,’ which could mean anything from a needle to a piece of retaining metal. Just fyi, this sort of thing is less of an issue in Britain, where fountain pens are fountain pens and anything not a fountain pen is a ‘biro’ and in India, where an ‘ink pen’ specifically means a fountain pen and everything else is just a pen. I (as a Brit) always assumed it was an American term that meant a fountain pen that you had to (re)fill with ink as opposed to a cartridge. Thansk!